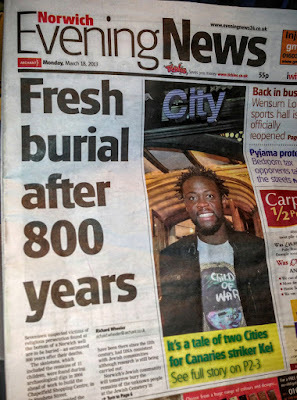 They were discovered in 2004 during an excavation of a site in the centre of Norwich, ahead of construction of the Chapelfield Shopping Centre. The remains were put into storage and have only recently been the subject of investigation. Seven skeletons were successfully tested and five of them had a DNA sequence suggesting they were likely to be members of a single Jewish family. The team has been led by forensic anthropologist Professor Sue Black, of the University of Dundee's Centre for Anthropology and Human Identification. Regarding the nature of the discovery, Professor Black said: "We are possibly talking about persecution. We are possibly talking about ethnic cleansing and this all brings to mind the scenario that we dealt with during the Balkan War crimes." Eleven of the 17 skeletons were those of children aged between two and 15. The remaining six were adult men and women. An 800-year wait to bury the bodies of suspected victims of religious persecution ended today in a ceremony at Earlham Cemetery. The 17 bodies, believed to be those of Jews who were killed and dumped in Norwich well, were laid to rest, closing a dark chapter in the city’s history. Workers found the remains in 2004 while preparing for the building of Chapelfield Shopping Centre. At the time it was thought they may have been plague victims. The bones were dated from 1150 to 1300 and in 2011 a BBC2 programme suggested the bones belonged to members of the Jewish community. A plaque has been unveiled in Norwich to commemorate the 17 jewish people whose bones were uncovered during an excavation in the city. The skeletons, thought to date back to the 12th century, were found when the Chapelfield shopping centre was being built in 2004. They were eventually buried in the city's Jewish cemetery in 2013. The remains of 17 people, 11 children aged between 2 and 15 and six adults, were found at the bottom of a medieval well. The Lord Mayor of Norwich, Councillor Judith Lubbock unveiled the plaque on Chapelfield Plain on the side of the intu Chapelfield Shopping Centre.